MapBan Advisory is a database of people from which MapBan does not recommend the acceptance of orders due to open dues. Sales of many Antique Map dealers are now-a-days done over the internet. Unfortunately not all buyers placing online orders are paying their bill for one or another reason. Registered bona fide map dealers can ad and have access to the MapBan advisory banlist of antique map buyers with unpaid invoices. Like Daniel we all have our dreams ! Unfortunately hitting a BuyNow button, seems for several people to fulfill their dream owing a antique map from the 15th or 16th century. MapBan banlist offers a list of people who have in the past ordered antique maps from mapdealers or auction houses and have never paid their bills and are not responding to emails sent by the mapdealer to solve the matter. A somewhat curious map of Europe, Africa, and Asia is to be found in apocalyptic literature originally emanating from Wittenberg in 1530 or even 1529. One of the first impressions of Daniel's Dream mapwas used by the printer Hans Lufft to illustrate two works: one a commentary on the prophet Daniel by Martin Luther (1530) and another linking the vision of Daniel with the assaults of the Turks on the perimeters of Christian Europe at the time.This edition of the map is slightly smaller than the first edition, and was originally printed on a text sheet of Luther's Wittenberg Bible. 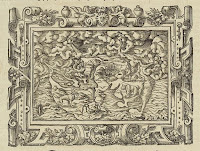 For this later edition, the woodblock was re-cut and surrounded in an elaborate picture-frame style border.